Compression hose is a simple, non-invasive treatment that may help prevent varicose veins in certain situations. If you already have varicose veins, compression hose may reduce some of your symptoms. However, there is a limit to what specialized hosiery can do. In some cases, your vein doctor may recommend alternative treatments designed to safely eliminate varicose veins for good. Three types of blood vessels work together to deliver oxygen to your organs and tissues. They also remove waste products like carbon dioxide. Arteries carry oxygenated blood from the heart and lungs to the rest of your body. Veins bring the deoxygenated blood back to the heart and lungs. The transfer takes place inside the smallest vessels, the capillaries, which connect arteries and veins. Of the three types of blood vessels, veins work the hardest to get their job done. They are responsible for moving blood from the lower half of your body to the heart. Overcoming the force of gravity is a significant challenge. The process is made possible by a series of tiny one-way valves located inside each vein. The valves open to allow blood to flow through, then close to prevent any from leaking backwards. If valves are damaged through injury or disease, blood doesn’t move towards the heart as it should. Instead, it pools in the legs, ankles, and feet, leading to a variety of problems. Pressure from the pooling blood can damage other valves. It also strains the vessel walls, and eventually, the vein starts to swell. Veins located close to the surface of the skin may begin to protrude, appearing as thick, knotted, rope-like bumps that are clearly visible. These are varicose veins. Sometimes, unhealthy veins look like webs or nets just beneath the surface of the skin. These are known as spider veins. The most common cause of varicose veins, spider veins, and other venous disorders is Chronic Venous Insufficiency (CVI). Unfortunately, this disease often goes undiagnosed. As a result, many patients are not offered comprehensive treatment plans that can effectively eliminate the problem. A specialized vein doctor in New York or vein doctor in New Jersey has the training and tools necessary to ensure an accurate diagnosis. 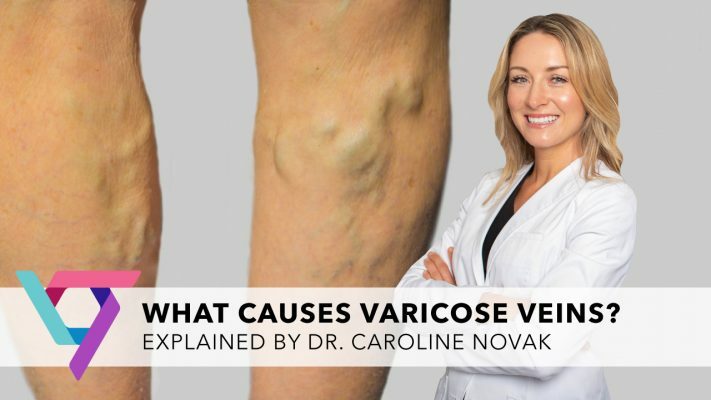 When you visit a vein treatment clinic, you can be sure that your physician will find the underlying cause of your varicose veins and offer you cutting edge solutions that are customized for your unique needs. How Does Compression Hose for Varicose Veins Help? Many practitioners recommend compression hose for varicose veins, because it supports healthy circulation in the legs, ankles, and feet. The hosiery is typically designed to offer more compression on the lower part of your legs, with graduated pressure levels towards the top. Compression hose is available in a range of pressure levels to meet varying needs. Lower compression levels are available over-the-counter in your local pharmacy. Higher levels should be fitted by your doctor to ensure that they are delivering enough pressure to help your circulation without causing an obstruction. Compression hose covers your feet, ankles, and both of your legs. However, you may not need this level of support. You can also purchase thigh-high compression stockings or knee-high compression socks, as well as compression sleeves that cover your legs, but not your ankles and feet. Compression therapy may prevent varicose veins in women who are pregnant and individuals recovering from surgery or experiencing other short-term conditions commonly associated with varicose veins. However, it is unlikely to prevent varicose veins in people with ongoing risk factors, such as a family history of vein disease. If you have already developed varicose veins, compression hose may soothe some of the discomfort and swelling you are experiencing. Unfortunately, compression therapy may not be enough to permanently resolve the issue. In that case, your vein doctor in NY or vein doctor in NJ may suggest alternative solutions. What Treatment Options are Available When Compression Hose for Varicose Veins Isn’t Enough? Untreated vein disease can lead to serious complications, so if compression hose isn’t keeping your varicose veins in check, your vein doctor may recommend a more aggressive strategy. The good news is that with today’s advanced treatment options, you don’t have to visit a vascular surgeon and undergo painful, invasive vein stripping surgery. Cutting-edge varicose vein treatments are designed to be minimally invasive, and they are performed in your vein specialist’s office. The procedures take less than an hour to complete, and little or no recovery time is necessary. There are a variety of options for reducing or eliminating even the most prominent varicose veins. All of them have the same objective. The varicose vein is permanently closed, so the tissue can be reabsorbed by the body. Blood is automatically rerouted through other, healthier veins. Before the procedure, your physician will numb the area with a local anesthetic. With the help of ultrasound, your doctor will access the unhealthy vein through a small incision in your skin. Usually, these incisions are so small that they don’t even require stitches. Once the procedure is complete, you can resume your normal activities right away. The Board-Certified experts at the Vein Treatment Clinic have specialized education and years of experience in diagnosing and treating venous disorders. They will help you determine whether compression therapy is the best choice for your condition. You can schedule a consultation online or by calling the clinic at 855-386-0195.